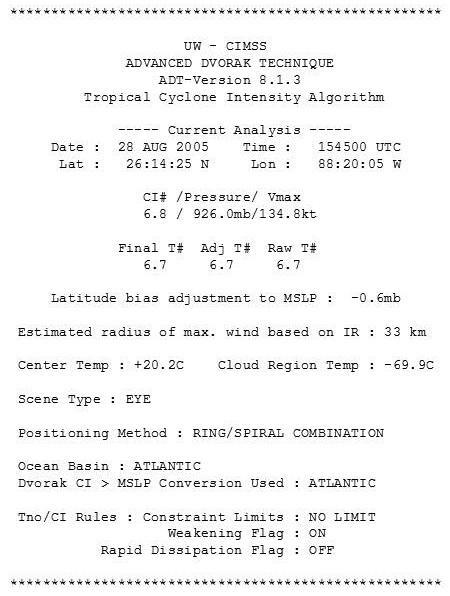 The GOES-R Hurricane Intenisty Estimation (HIE) algorithm is a derivative of the UW-CIMSS Advanced Dvorak Technique (ADT) which utilizes longwave-infrared, temperature measurements from geostationary satellites to estimate tropical cyclone (TC) intensity. The HIE/ADT is based upon the operational Dvorak Technique (DT) developed by Vern Dvorak of NOAA over 30 years ago. This step-by-step technique relies upon the user to determine a primary cloud pattern and measure various TC cloud top parameters in order to derive an initial intensity estimate. Various rules regarding TC development and intensity change over time are employed to guide the user in the scene selection process and govern the rate in intensity change over a given time period. The ADT/HIE has advanced beyond the scope of the original DT using new image analysis techniques to further improve upon the original methodology. The Dvorak Technique continues to be the standard method for estimating TC intensity where aircraft reconnaissance is not available (all tropical regions outside the North Atlantic and Caribbean Sea), however it has several important limitations and flaws. The primary issue centers upon the inherent subjectivity of the storm center selection and scene type determination proceedures. Secondly, learning the Dvorak Technique and its regional nuances and adjustments can take a significant time to master. Finally, the technique was developed more or less empirically by Dvorak and his colleagues, without the aid of computer analysis, to determine statistical relationships between various environmental parameters and intensity. The ADT/HIE (and its predecessors the ODT and AODT) sought to alleviate many of the limitations found within the Dvorak Technique and previous objective algorithms based upon methods outlined by Dvorak. The ADT/HIE currently utilizes a state-of-the-art objective storm center determination scheme and cloud pattern determination logic to remove the subjectivity aspect from the intensity estimation process. It also can be applied to all phases of the TC lifecycle; something that previous objective schemes could not do. Additionally, the ADT/HIE makes use of statistical analysis results obtained from a 10+ year sample of North Atlantic storms, along with a significant sample of West and East Pacific storms, covering the entire spectrum of TC intensities to derive a regression-based intensity value estimate for various phases of the TC lifecycle. Finally, the ADT/HIE can intelligently make use of multi-platform satellite information to help alleviate "problem areas" where IR imagery does not provide sufficient information to allow the ADT/HIE to work properly (e.g. during the "central dense overcast" stage prior to the appearance of an eye in the IR imagery). The ADT/HIE is a powerful but easy-to-use TC intensity estimation guidance tool possessing an accuracy on par with estimates obtained by experienced TC forecasters using the Dvorak Technique. The ADT/HIE provides real-time intensity estimates in terms of a current intensity "bulletin" as well as a complete intensity estimate record of the ADT/HIE over the entire TC lifecycle. An ADT/HIE intensity "bulletin" shows not only the current storm intensity but also various analysis parameters that went into determining the current storm intensity. It is the primary output of the ADT/HIE algorithm. The timeline example below not only shows the ADT/HIE intensity estimate (blue) but also the corresponding estimate timeline obtained from NOAA/SAB using the DT (red) and the Final NHC "Best Track" (green), which primarily utilizes aircraft reconnaissace as ground truth. The ADT/HIE history can also be view in a text listing which contains more information such as storm location, cloud and eye temperature values, and other ADT/HIE analysis-specific information. Real-time GOES-R Proving Ground ADT/HIE estimates can be found here. The study compared 30-minute versus 15-minute image availability to assess the impact of improved temporal resolution imagery. Validation was performed versus NHC "Best Track" wind speed estimates interpolated to image times. The image resolution for all images was 3km, and all statistics are conducted on a homogeneous data sample. Overall, the ADT/HIE statistics were very close to meeting GOES-R AWG specifications. The ADT/HIE accuracy was well below GOES-R specification of 5.0 m/s, but the precision was found to be slightly above the desired specification of 8.0 m/s. One possible source for error could be the poor viewing angles for many of the images in the sample (near or greater than 50 degrees). Large viewing angles will affect not only the interpretation of the cloud scene types, but will also result in poorly sample eye regions, affecting the determination of the structure and temperature of the eye and resulting in weaker intensity estimates. This is reflected in the overall negative (weak) biases for all of the data sample statistics listed in the above table. Storm track (left) and image with poor viewing angle (right) for Hurricane Helene (17 Sept 2006/19:15UTC).